I don't think that the part on the floor is from a Ford, but it does remind me of an NRS crankcase. It looks like home to me. Is that a tire shrinker and a shears in the middle of the room? When I was a kid (60+ years ago) my mothers parents had a ranch in Santa Clara , CA. There was a barn that had a "garage" area. All kinds of interesting things were to be found there. This photo very much reminds me of that barn. I wish I had paid more attention. At the time it was just a lot of old junk. Herb, This is just a great picture. Thank you for sharing this one and so many more with us.When I was a youngster in the late 40s there was blacksmith shop in this little town where I grew up. There seemed to me that there was always a lot of farmers with different pieces of equipment waiting for repairs.Men gathered talking and smoking,kids running around and dogs barking! Wonderful memories, again thanks Herb. Our local blacksmith passes away in 1990. In addition to blacksmithing he had a hardware store, junk yard and bailed hay. Hubert was a WWII vet who lived with his dog on a cot in the store and had no running water or indoor facilities. Whenever you asked him how he was do I he would reply: terrible, terrible. And when you asked him what the trouble was, he would reply: Taxes, Taxes. I was enjoyed doing business with him and we had lunch together several times at Zelma's cafe. I miss the old fellow, characters like him rarely exist any more. The little town I grew up in, in western NY state, still had a blacksmith shop into the late 80's. He didn't shoe horses anymore, but stayed very busy making wrought iron railings, and repairing farmers equipment like sharpening the knives on bean pickers. Great memories. That's a great looking place that I would love to be able to walk around and explore. Except if there was an earthquake. Can you imagine all those horse shoes raining down out of the overhead ? There was a blacksmith shop close to me in the 50's. Old Boyd Bayless had a T block on the floor the used as a sort of anvil when his regular big anvil was not used. He had a rig built in the floor to build wheels on. There was a big wooden box under one of the benches that had a lot of homemade tools in it. Sometimes he would make a bolt or nut and then make a tool for it. He had quit doing horses years ago because of a bad kick injury so then did mostly fixing anything. He could put a tractor engine block that was broken back together with bolts weld about anything and made his bread and butter forge sharpening jack hammer bits for local utility companies. Did anyone notice what appears to be a soldier standing at the right side of the door? Maybe just an illusion? I think that's the smith's helper wearing a leather cap/hat just in case there is a horseshoe rain storm. The "helper" looks odd - the head-gear and protective clothing look out of place. There are a lot of oddities in this picture. What is that item on the floor by the support column ? Charley, I don't think that's a fan - no mechanism to run it and the angle of the roof suggests the blades are items hung from the roof timbers. Maybe swath boards from mower sickle bars ? I think that is a lady in a hat in the background. Maybe an old nag waiting to get shod! You can see part of the belts and line shaft mixed among the rafters. I suspect there is a small belt to run that fan hidden behind the horizontal beam. My first thought on the crankcase standing on the floor also was Maxwell. They used a longer crankcase than most two cylinder cars (and it was aluminum), because they put the engine and transmission into a enclosed single unit. They did this a few years before Ford did with the model T.
The fellow in uniform (probably a suit and hat?) was probably a Civil War veteran. 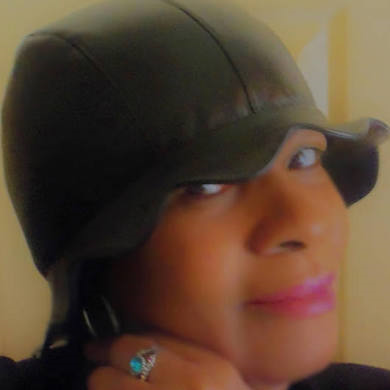 Some of those people wore their uniforms for much of their lives after the war. Both blue and gray did so, sometimes to proclaim their continued allegiance to "their" cause. A wonderful photo! So many little details to look at. Among my family legends is that my grandfather kept his and his dad's blacksmith shop going on my grandfather's ranch until he sold off the main ranch in 1964. When my brother and I were small, we used to play in there. We made nails from scrap wire or welding rod remnants, using the big vise, hammers, and hand crank grinder. I really wish I could have saved the whole place somehow. The big forge was left, but most of the tools were kept. Sometime after my grandfather passed about a decade later, I wound up with most of the old tools, including that big old vise. I still use it often. Thank you Herb for the look back! I think that's a mannequin at the right. Look at the position of the right arm. And it looks to me like those are Model T axles standing on end near the anvil. They must have been very handy for making all kinds of things. No forge or bellows? Mannequin in a "blacksmith shop"? Thanks Herb. This photo leaves lots of room for speculation. The only thing this and my grandfathers shop had in common is the horse shoes ,anvil and hammer. 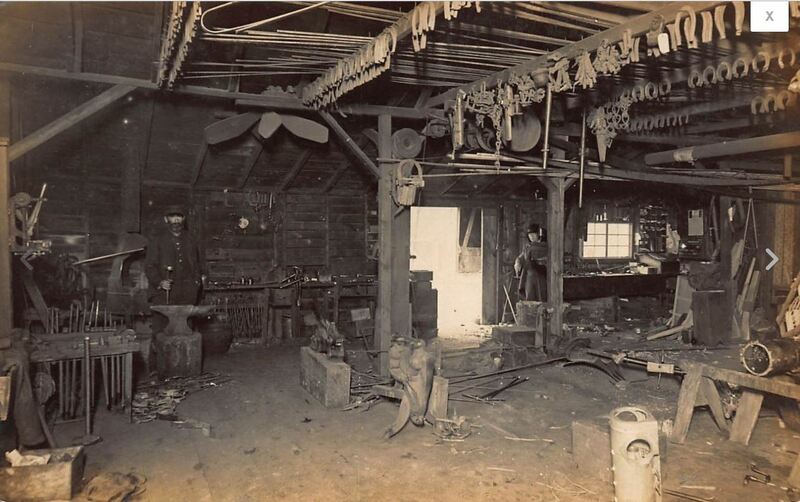 Could that be a forge made from a steel barrel and the bellows with the handle protruding toward the arm with a hammer in the left side of the photo? Enlarging the photo, I do not think the blacksmith was born using his left hand. The way he is holding the hammer looks a little off, but also looks like he is missing his right arm, maybe from the elbow down. You can also so see the air tube going into the forge. I think the kid is just a little shy and is staying out of the way. Or he just has his hand in his pocket. What a wonderful old picture. It brings back memories when you would have gruff old men who could fix or weld anything. My grandad had a forge with a hand crank blower on it. Looks like a crank handle to his right side. I'm gonna ask: What is it with some folks and letting the latest tool fall to the floor when finished using it? I don't like bending over. Perhaps as I'm tall. The posts could be lined with tools. Something else laying on the floor reminds me of a steering column. Shiny black paint above the firewall flange and dull below. And the repair on the stove pipe running just below the rafters. Haha! The belt wore it thru. Very cool pic!